Sunlight or Shade? Which countries tend to give Ireland the most/least Eurovision points? So what are the facts as regards the countries that Ireland is most likely, or least likely, to win points from at the Eurovision Song Contest? 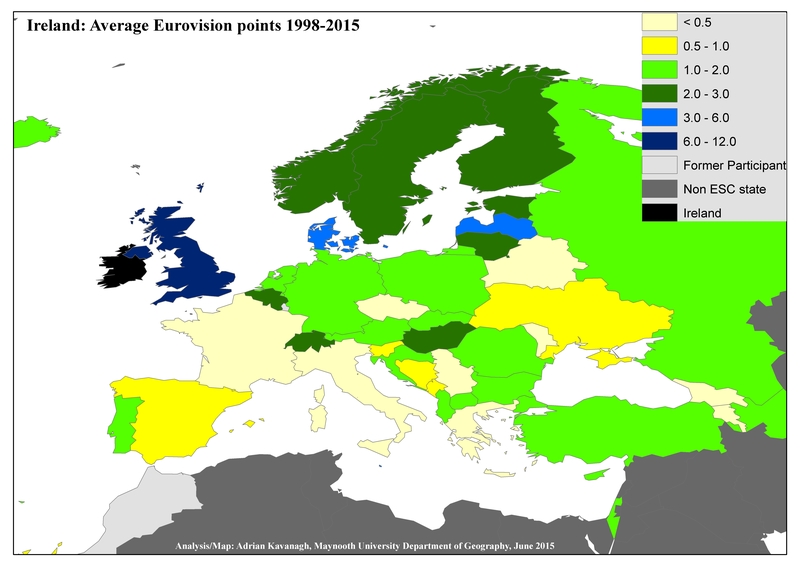 The trends that emerge show that some of Ireland’s very best “supporters” at the Eurovision Song Contest (since the introduction of televoting in 1998) do, admittedly, include a number of “Western” states – including Denmark, Malta, San Marino, Finland and Sweden, but particularly the United Kingdom – but Irish acts have also won higher levels of support from the Baltic States – particularly Latvia – and Hungary than they have won from the rest of the “Western” countries. Indeed, some of Ireland’s lowest scores during the period since televoting was introduced in 1998 have come from “Western” countries, such as Italy and France.